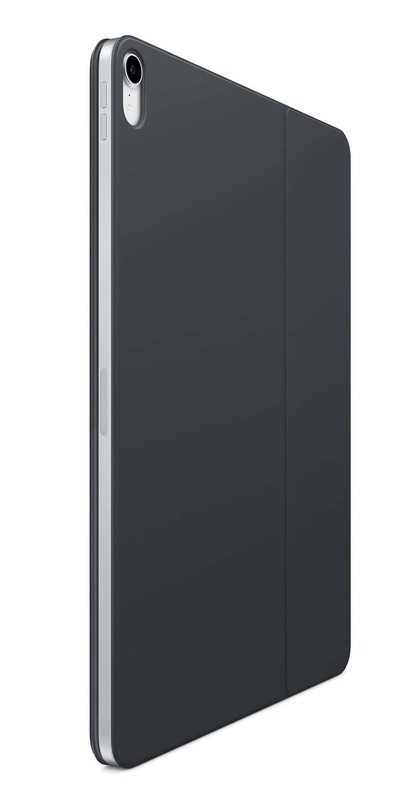 As its name indicates, this is a folio cover that wraps around the front, left side and back of the iPad Pro. This allows it to prevent scratches to the all-important screen, and the whole iPad gets a modicum of protection. But this isn’t a rugged case by any stretch of the imagination. It’s going to do almost nothing to prevent damage if you drop your tablet. But extremely protective cases are thick and heavy, and those are two words that could never be used to describe the Smart Keyboard Folio. The tablet by itself is 0.23 inches thick, and is still just 0.5 inches with the case added. The version for the 12.9-inch iPad Pro weighs in at 0.87 pounds, so case and tablet together only come to 2.3 pounds. 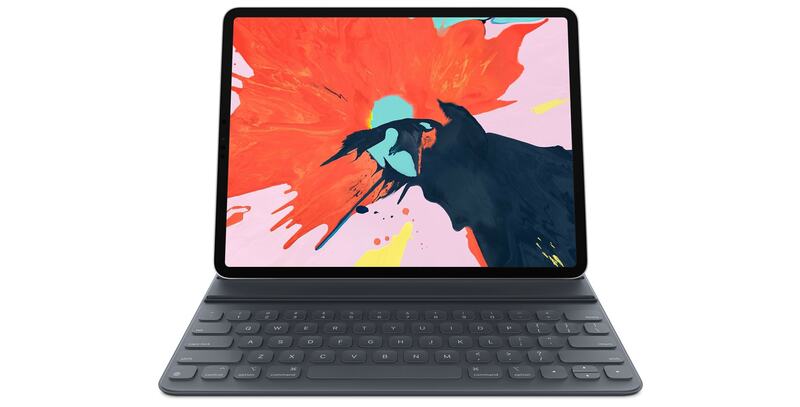 As one would expect, a MacBook Air, Apple’s thinnest and lightest 13-inch notebook, is thicker and heavier than a 12.9-inch iPad Pro in the Smart Folio Keyboard. The Smart Keyboard Folio and the iPad Pro together are just 0.5 inches thick. The case is held to the computer with magnets. Lots of magnets. The connection is surprisingly strong, to the point where they don’t come apart without some effort. 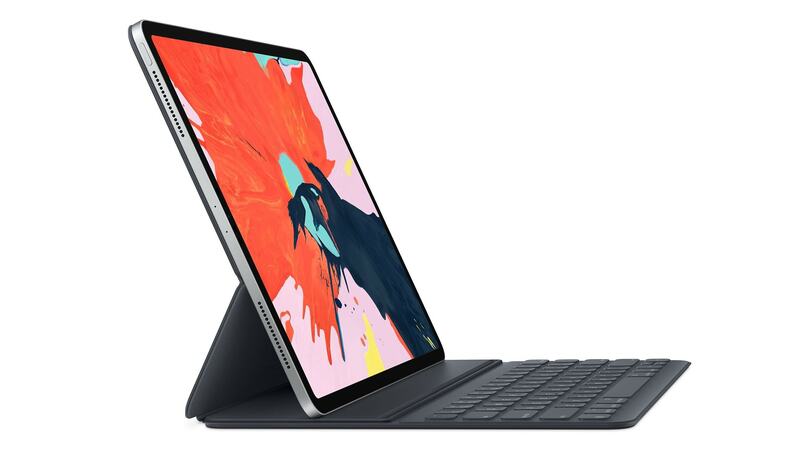 Because three of the edges are always uncovered, you can use the iPad Pro’s USB-C port while the case is closed, or listen to music through the speakers. Unlike some cases, there’s nothing to interfere with clipping the new Apple Pencil to the side of the tablet so it can charge. You can get the Apple Smart Keyboard Folio is any color you want… as long as it’s black. There are no other color options available. And the material is plastic. It’s relatively professional looking but not fashionable or luxurious, which is a bit disappointing from a product this expensive. This folio case easily opens then folds into a keyboard and stand for the iPad Pro. The keyboard area is 10.6 inches wide, while a typical desktop keyboard area is 11 in. wide. Each key is 0.6 by 0.6 in. with 0.15 in. of key separation. That’s the same size as desktop keys. In short, there’s nothing cramped about this keyboard. The Smart Keyboard Folio delivers a standard key layout. However, it does have a significant issue: key travel is almost nonexistent. Pressing on any key causes it to depress just slightly. There isn’t any room for more in a keyboard this slim, but the result is not a great experience for hours of typing. At least you never have to fear something getting caught under a key. The keyboard is a continuous sheet of fabric that’s laser ablated to form the shape of each key. There are no openings. Unfortunately, there are also no backlights. They just aren’t possible with the way this case is made. Apple filled all the available space for keys with a standard QWERTY layout, which means there’s no room for the extra row of function keys included in virtually every rival iPad keyboard case. Instead, you’re limited to the key-combinations that come with iOS. e.g. COMMAND-H to open the Home screen and COMMAND-TAB to switch between applications. 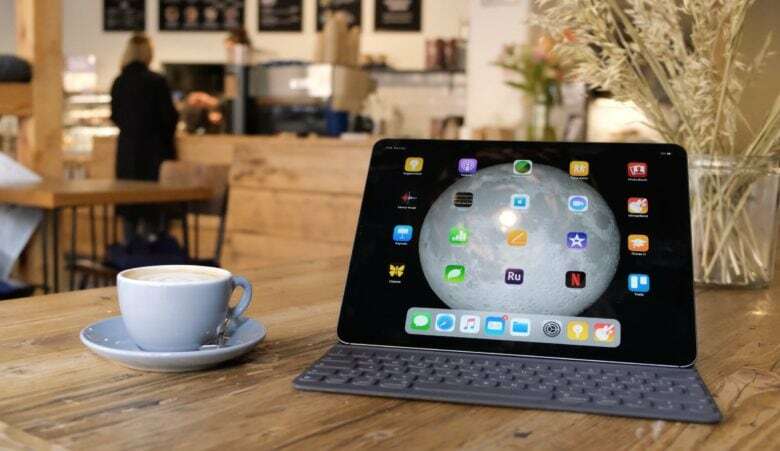 The Apple Smart Keyboard Folio does a fine job of acting as a stand for the iPad Pro. More magnets hold the tablet in place so its very secure. Tapping on the display doesn’t make the tablet shake or move. The limitation of this design is that it only offers two typing angles. The tablet can be set leaning back at 130 degrees or standing nearly straight up at 110 degrees. The first is nearly ideal for typing, and the second is the best option available for watching video. The Apple Smart Keyboard Folio arranged as a notebook computer. Unlike the Smart Keyboard for previous iPads Pro models, it’s not possible to fold this case into a stand with the keyboard hidden. It’s always there, being mildly irritating when you’re watching video. But it does offer excellent “lapablility” — the ease of using a notebook like device in the lap. Tablet and case are small enough to fit easily on any reasonable-size lap. The Apple Smart Keyboard Folio is just about the thinnest and lightest case possible with a keyboard in it. That’s great in many ways, but it affects the typing experience. The keyboard is large enough to be easy to type on, but the near lack of key travel becomes an issue during long typing sessions. This keyboard case is so portable you shouldn’t have an issue carrying it everywhere, which isn’t always true of mobile keyboards. So just remember, the keyboard you have with you is the best one. If only the exterior of the Smart Keyboard Folio was nicer to look at. Apple is asking $199 for the version specifically for the newest 12.9-inch iPad Pro, and $179 for the 11-inch version. For that kind of money we expect something besides black plastic. While these are certainly expensive, there are very few alternatives. The 2018 iPad Pro just debuted a few days ago, after all. Some companies make universal mobile keyboards, but at the time of this writing there’s no rival keyboard case designed specifically for the latest iOS computer.